Wherever possible roads have been closed, sections are on a disused railway track, and traffic has been limited on certain sections of the route. Please do not deviate from the designated route for any reason. This is not only a risk to you but to motorists that may still be using part of the roadway. Due to unforeseen circumstances, minor adjustments may be made to the route. They will be well signposted and stewards will direct you. In the event of a major incident being declared this race may be stopped or cancelled without warning. 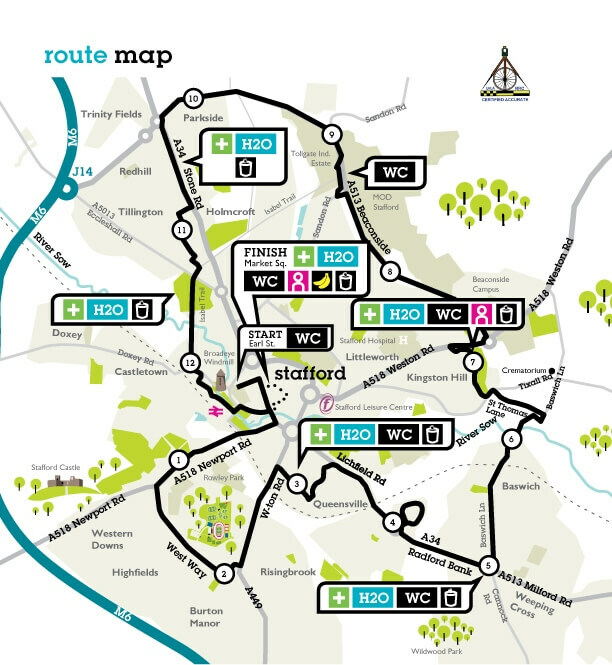 The town centre road closures will be in place from 6.00am, the race infrastructure will be erected once these closures are set up; this includes an overhead race gantry. All Sunday morning delivery vehicles must have left the town centre before 6.00am. Due to all the current road works on the roads surrounding the town centre you are advised to allow extra time to travel. Bridge Street, Gaolgate Street, Market Street, Market Square, Greengate Street (Market Square to South Walls), South Walls (Greengate Street to Junction of Greengate Street Service Road), Eastgate Street (Cope Street to Malt Mill Lane), Malt Mill Lane, North Walls/Salter Street Service Road, Salter Street (part to exit of Vine Hotel Car Park) St Martin’s Place, Martin Street, Greengate Street Service Road, Tipping Street, Stafford Street, Crabbery Street (Except for St John Ambulance), Chapel Street, Princes Street, Mill Street junction of Greengate Street, Mill Street to have one way reversed, Mill Bank to junction of Water Street, Tenterbanks and the cycle route from Izaak Walton Street to Doxey Road. Earl Street will be closed from 7.00am – 11am for the start of the race and set up of the overhead gantry. Parking restrictions on Tenterbanks and South Street from 5.30pm the evening before, Saturday 16 March.